HAPPY THIRD BIRTHDAY TO MY PRINCESS!! * This is photo heavy but worth it.... Click on the video and enjoy with a cup of Joe. You've seen some sneak peeks so here's some photos of the final products. What a great day!! First up is the banner and the ceiling decorations. 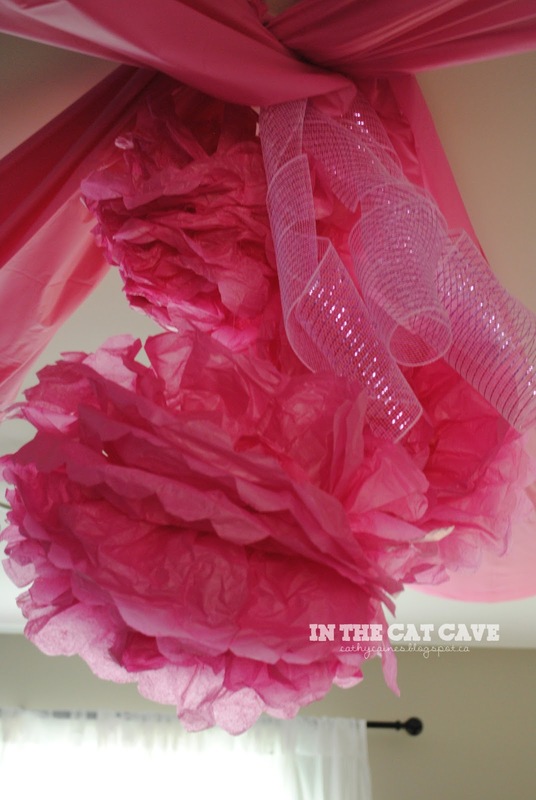 Tissue paper balls and table clothes line the ceiling. Sure sounds like an economical option! Tutus and super hero capes in lieu of loot bags... but they got them a bit early. 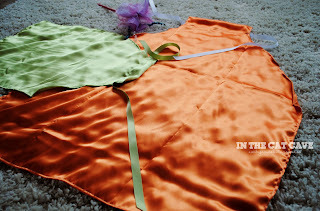 The super hero capes were created from scratch. I just eyeballed what they would look like and stitched a binding on the satin. The tutus were created using a guide from the www.momdot.com. I did sewed the elastics together and also sewed the ribbon on first. What's a royal party without wands and crowns? I used the Sweet and Sassy girls guide for the wands, as well as used Hank+Hunt for the crowns. It's time to invest in a good glue gun folks! How cute is my little prince? He lasted about 5 minutes before he took a nap for the entire party!! Here is some of the outdoor decorations we had. Bows and flowers in the plants, a welcome sign that I created in word using clip art. I then matted it on paper, sewed it on felt, which was sewed onto a flag. The wind was blowing this around so much I had to pin it. The sad part about this day is that the helium balloons I had tied with tulle and put int he ground with golf tees kept breaking from the heat. I couldn't be more disappointed. We also had a picnic so the little tykes could sit down and have their sandwiches. In order to do so we needed blankets... (I am so lucky to have my grandmother that has given me several beautiful quilts)... and packed lunches!! That ribbon really knows how to dress up syrofoam!! We had fruit skewers but I forgot to take a picture until too late! Wait... are we talking about the food??? CAN YOU BELIEVE THIS CAKE? Big shot out to Tricia Warford you made this cake, the princess hats and the crown cupcakes! I had the plates, lighter, candles, knife all in a pile ready for cake time. My princess was quick to notice someone wrote on the mirror. Huh. Can't do that. She was okay once she realized what it said! We had a bouncy castle, trampoline, soccer gear, bubble table, water table, kiddie pool, etc. Wish you all could have been there! This is amazing....Jane is one lucky little girl! Thanks for mentioning me, Cathy! It was a pleasure to make all the goodies for the party! Wow!! The birthday party is looking very nice. Your daughter and son both are very sweet. She is very photogenic. The decoration is also very nice. I love balloons as a part of decoration,they look wonderful. 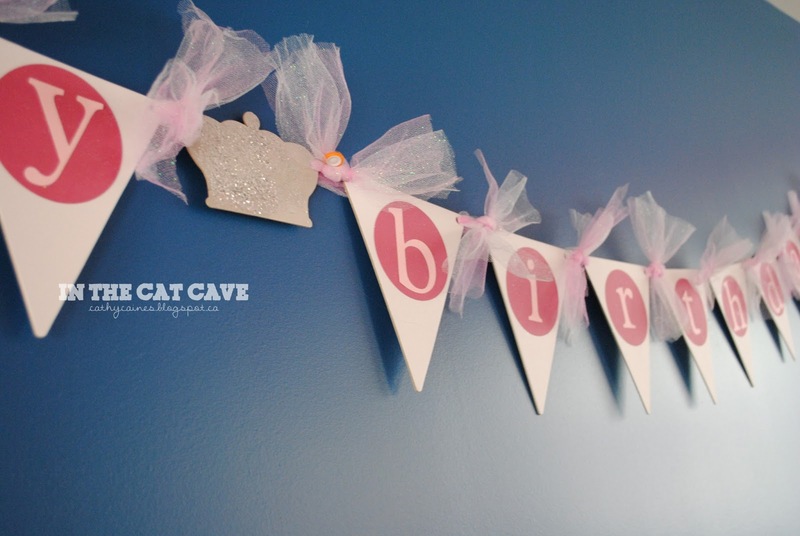 For any birthday party they are the most important part of the decoration. Without them any decoration looks incomplete. You must have planned many things for making the birthday celebration of your little angel very wonderful and outcome of your planning can be seen. It is very wonderful.